According to Sustainable Health Enterprises (SHE), 18% of women and girls in Rwanda miss out on school and work because they cannot afford menstrual pads. Sometimes they even feel forced to substitute rags, mud and leaves which is not only humiliating, it can lead to infection and disease. In numerous developing nations, the stigmatization of menstruation and the lack of access to affordable sanitary supplies have serious developmental and economic consequences for women. Most will simply stay home from school or work while menstruating. In Rwanda alone this translates to a possible GDP loss of $115 million each year. In 2008, SHE Founder and Chief Instigating Officer Elizabeth Scharpf witnessed this phenomenon among factory workers in Mozambique while on an internship for the World Bank. She started SHE with the goals of providing women with greater access to both menstrual products and basic health education. This interest ultimately led her to Rwanda, a country that possesses both an urgent need for women’s health services and an entrepreneurial spirit favorable to jumpstarting microbusinesses. 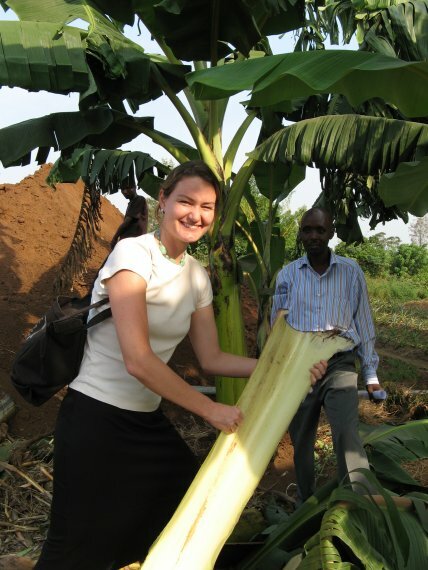 There, Scharpf and SHE designed a menstrual pad made from banana tree fibers—a local, renewable resource, which SHE sources from two (largely female) farming co-ops in the eastern region of the country. SHE looked to existent women’s groups and community health networks to create a microcapital business model that would allow local manufacture and distribution of the pads. SHE’s return on investment helps fund wider health initiatives like educating both men and women about the basic aspects of menstrual hygiene management, and advocating with the Rwandan government to support access to menstrual products and health services countrywide. SHE has a full-time operation in Rwanda, and offices in New York City. Scharpf describes both SHE’s team and its efforts as a “quilt”—diverse people and talents working towards larger ideals. SHE seeks to build business opportunities into every stage of its production process. 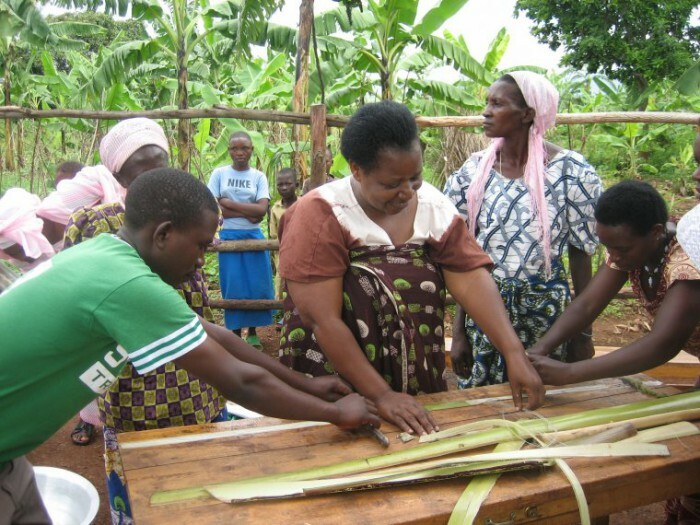 It provides equipment and training to Rwandan banana farmers so that they can process the fiber and sell it to SHE—providing incremental revenue opportunities from something that was once discarded. The fiber is brought to its community factory to be cut, carded, washed and solar dried. Finally, it is made into menstrual pads that are sold affordably to women and girls. SHE also participates in health education to debunk myths about menstruation and advocates to lower taxes on menstrual pads.